Hosta ‘Great Expectations’ is an especially beautiful hosta. When it emerges in the spring, the leaves have a bright yellow center and wide irregular bluish-green borders. By mid to late summer, the yellow leaf centers have become a pale, creamy white. 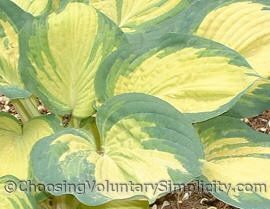 This is a hosta that grows very slowly, and because it can be one of the more difficult hostas to grow, some people advise starting all Great Expectations in pots sunk into the soil instead of planting them directly into the garden. Supposedly this process promotes root growth by allowing more moisture and nutrients to stay near the root system… until the hosta becomes root bound, at which time it should be planted directly into the garden. I have had no personal experience with this method. I only have two Great Expectations, and I had already planted both hostas directly into the garden before I ever read this advice. 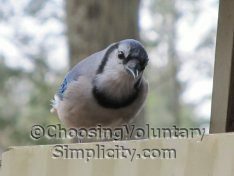 Happily they have grown enthusiastically over the years… including the smaller two-eyed Great Expectations that was almost completely decimated by visiting wild turkeys. Both of my Great Expectations produce large numbers of near-white bell-shaped flowers, usually flowering here in early July. The seed pods do mature but I have had very little success with any of these seeds germinating. This spring I had 5 hostas that did not come up at all. Today when I went to transplant some others I had in holding area the dead plants had huge root systems but produced no greenery? What did I do wrong or what could be the problem, can anyone help me with this? My favorites “Love Pats” are the ones I miss the most and have the biggest root balls…………….Thank You! 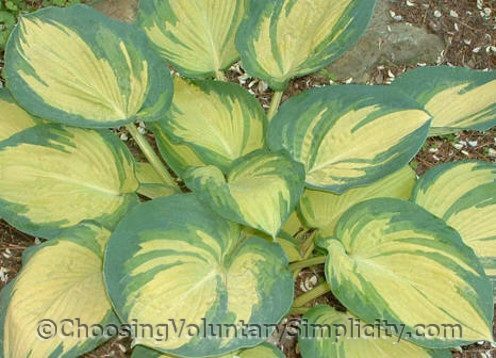 This is one hosta I really would like to have someday. I love that soft yellow color. My Great Expectations had two small eyes. I broke one off accidentally when I was planting it so this hosta looks very stunted right now. After seeing these photos I have dreams that my will some day look like your’s. Absolutely beautiful. Wonderful photographs. I have one of these and it is doing very poorly. I had not heard of keeping it potted. Mine is already in the ground. I wonder if it would benefit from being dug up and repotted or if it would be better to leave it alone.